Crownbet is not an old nor well-known or well-established company in the market of online betting. However, It is one of the most promising, well organized and well-funded ones. The reason for that are the founders of the company – Matt Tripp, who happens to be the former owner of Sportsbet and the billionaire James Packer. The collaboration between these two delivered a great and extremely vastly developing company. That is one of the reasons why every single detail and specification is probably covered by this bookmaker. Crownbet is established in 2015 and is regulated by the Northern Territory Government of Australia. Still, the company does not have a huge amount of clients but that is changing every day and alongside that grows the popularity among gamblers. Crownbet is the official partner of Australian Football League, NRL, Cricket Australia, FFA, Netball Australia. Nevertheless, Crownbet is in the top 1000 most popular websites in Australia and top 75000 in the world. The service this bookie offers is amazing in many ways. 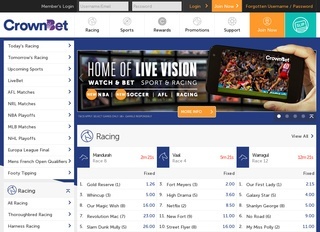 The design of Crownbet is immaculate, with white and blue dominating the layout. It’s easy to find all the elements and the bonus offers are quite good. Even novice punters won’t have any difficulties finding their favorite games. Being so well funded and having the know-how of Matt Tripp the company can allow to offer many sports available for bets in their portfolio. There are baseball, golf, eSports, soccer, different types of races. Even though the company is growing rapidly, there are no casino or poker games available at the moment. However, despite the fact that that is a signature of Sportsbet, similar additional games and betting options are not impossible to see on the platform. Live betting and live streaming of some sports events are an option. Each client, however, decides if that sort of coverage is what he/she wants and if that suits him/her best. For further ease of the bettors, there are live statistics of the events. These should make live betting even faster and easier. To go a step further, the owners of the company decided to give their clients access to the website via apps. There are special apps for Android and Apple devices. These two apps make mobile betting even easier and faster. All the needed information to make a decision is displayed there in the best way for a mobile user. Live streaming is also available on the apps after registration. According to a survey in the country, the mobile apps of Crownbet are among the best-developed ones in the business. The company offers very good and high odds and betting options. Different markets are available like win-draw-win, draw no bet, half time/full time, double chance, both teams to score and many others. All betting options can be seen on the website of the online bookie. Because of the huge diversity of sports and sports events, clients should check if the option they are looking for is available as the betting options for different sports are different. Security and comfort of betting are one of the prime goals of the online bookie as it is a must if the company wants to grow and prove itself. That is why Crownbet uses SSL encryption for the transfer of data online. That guarantees that no personal or financial information will be lost or stolen during transfer. Another security measure guarantees that the employees of Crownbet but cannot share any information related to clients or financial transactions. They must keep everything confidential. To avoid fraud, the company may ask for photo verification of the account alongside the ID one. The platform offers two languages to pick from – English and Chinese. These are also the languages clients can use. The alternative ways to contact the company are many. The owners make sure their clients can find all the information needed when they needed, so they offer phones, live chat and an online form to fill. Social media is another channel the clients can use to contact the company. They have Facebook, Instagram and Twitter profiles. Making a deposit or withdrawing money from an account is super easy. Each client should first provide all the needed personal information and then deposit his/her money in the bank account of the company. Additional information about the paying methods is available in the banking section of the website that can be seen after registration. The only available currency for this online bookmaker is Australian and the New Zealand dollars. This is due to the ownership of the company that is 100% Australian. The maximum payout for a day is AUD250000 including pre-post. Deposit bonuses and other rewarding systems are widely popular with Crownbet. Deposit bonus for everyone who joins Crownbet is available. For every $50 the company adds more $150 and that allows the gambler to play with $200. The loyalty program is another way to win. Up to 5000 bonus points from each $50 deposit made on the website. The bonus points can later go into use for getting tickets for sporting events, playing in real casinos or for dinners in some of the establishments of the owners of Crownbet. 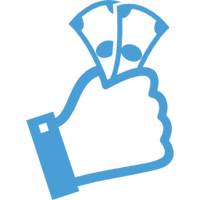 Another bonus is the 2nd matched bonus that gives up to $50. Therefore, the company stimulates the bettors not only to start playing with them but also encourages them to keep playing and rewards them higher the more they play.